Being sentimental has dangers. Making poor decisions is one. Hording is another. As I sell my collectibles and comic books, I find myself occasional sentimental. Most of the time I push it aside. But, I found a comic book yesterday that is very interesting. This comic book was the last one my father purchased. It was published a month before I was born. I found that out by the simple steps of logging in all of the comic books. My father’s collection starts when he is around 12 to 13. That coincides with his move from Norfolk VA to Baltimore. From there, he mostly starts with Disney, Gold Key, and Dell comics. They made comic books of popular movies and shows. It was at that time that I was able to connect something my mother told me. My father was not quite illiterate but he really did not have basic reading skills as a young man. One has to remember that it was the late 1950’s into the 1960s. Civil Rights were peaking and illiteracy was not uncommon for young, black men. My father also had learning disabilities. They were not properly addressed but back then, they were rarely addressed at all. On top of that, his mother’s solution was to embarrass him in public. This may be where my father developed the fake front that became a true one later in his life. The one where he was always the best, smartest, and most talented no matter who he tromped over. He was also a gifted mathematician. My brother got that. I unfortunately got a weird, mutated version that gives me an amazing ability to intuitively do math and come to correct conclusions with zero knowledge on how I get there or how it works. Math and reading are quite different skills and his reading is what suffered. With these early comic books I can see my father’s reading progress. He starts with movie comic books. There he knows what is said and what the plot is and he is able to teach himself to read and read well. As he becomes 14 or so he starts picking up superhero focused comic books and for the next ten years he collects steadily and heavily. Once he meets my mother his collecting slows. Once they have my brother it drops to occasional issues. And then there is this last issue purchased the month before I was born. There are no comics after my birth date. On a humorous note, I questioned if my birth sucked my father’s comic book interest into me. When I was 12 I developed quite the taste for comic books. I eventually fell out of them because they were not enough reading material to satiate me. This was before volume bundles were common. I suspect that it was a combination of life, job, and time, and access. My father did not like to shop and I don’t think he’d go out searching for comics. The way the books are numbered show patterns that create an image of places he went now and then and grabbed the comics for convenience. Shortly after I was born my father decided to move from the area and almost split up with my mother. He didn’t like being a family man and was surprised that shedding his wife and children was so complicated. He was in his mid thirties by then. His focus on social appearances may have made him stray from his own self interest when it came to his comic books. In the eighties, men in their thirties were not to buy comics. I’ll never know the answers. For one, my father is dead these last seven years. For another, even if he was alive, he’d never have told me the truth. He abandoned the truth a long time ago when he learned the power of creative fiction. All in all I’m left with memories and pieces. So this comic book, this one… I’ll keep. My husband, my test subject to check if my heatless peppers are in truth, heatless, is ill. His highly inflamed throat cannot handle the lightest of space. He found BBQ sauce to have a burn in it today. That means I stare at my handful of orange peppers and ponder. My growing heatless peppers comes from my quest to add sweet peppers to my diet. I’ve had an aversion for a long time due to my distaste for bell peppers. With fear and experimentation, I’ve found that there are other peppers that do not have the bitter, overwhelming flavor of bell peppers. This is kind of like how I discovered avocado a few years ago and that I did not hate it. My aversion came from a poorly made batch a long time ago. The same goes for hummus. My quest for sweet peppers still needs for them to be pickled or cooked. I’m discovering a new flavor profile, if cautious in my adventure. I was told that I am doing it wrong. I purchased boxes to ship my items. “Boxes can be sourced for free,” I was told. Yeah, they can, but some boxes are more common. My items are small. The dimension of a pony is 7x5x4. That is a very small box and people often order one. I got a stack of boxes to do single sales so that I could save money. Buying to save is often something struggled with. The basics come down to the fact that the .20 cents per box I paid allows me to keep shipping down. My shipping costs are normally 3.80 to send the pony in the smallest possible box. That box is normally 8 ounces. With each ounce about 20 cents is added. A box that is free but twice as large can add 40-60 cents (include packing material so the item doesn’t knock around and become damaged). But I’ve learned that people are sensitive to shipping. I too remember the days of low costs and high shipping on ebay. Sellers made their money by avoiding the fees. Ebay struck back and now they charge me a fee for the shipping amount. If I charge my exact fee of around 4 dollars, ebay eats around .30 cents of that. I charge about 4.50. That has me breaking even on shipping. But how angry it makes people. The comics have a similar problem. I ordered comic book mailers. They are media mailers but thinner to hold comics tightly and securely. They cost me about .50 per comic. I use them because these are very old and rather valuable comics. Do you really want your $40, sixty year old comic arriving in a bubble mailer hopefully unbent and undented? I had someone offer me $10.50 on a $10 item. I asked why they had made an offer above the price. The response was free shipping. That means I’d spend around $4 in shipping on a $10 item as well as the %10 ebay takes from the value. I’d walk away with 5 dollars on an item that is a collectible and has a value. I could take the offer and move my inventory. But, I don’t mind waiting. The sales are addictive. It is fun to make money and do a bit extra with my time. But, I’m not going to stab myself in the foot for it. July is a notoriously slow from what I have read. Patience and time will get the stuff moved. They’ve been sitting in bins and boxes for well over a decade. Fifty years for most of the comic books and 12-15 for my ponies. Of course when you are a buyer you just care about price. It is interesting to see how I have reevaluated seller costs and shipping over the last month. Things don’t look the same from the other side of the line. As I sort through my ponies I have finally unearthed the ones that I first collected. The first few that I picked up where part of a random trip down the toy aisle and as gasp as I saw a Pony. That led to four year path of collecting that he shamelessly encouraged me in. The other night I pulled the last box out of the basement. I was annoyed because I knew that I was missing ponies. I was out of boxes and I had searched all of the boxes in the basement. Then, I remembered the blue bins in the garage. All of my bins are blue. My husband normally gets orange ones or random colors like neon pink. There are blue bins in a corner beside the Celebration Castle (the largest pony structure). I went downstairs and peeked. Sure enough, it was my missing ponies. We didn’t even recognize the containers. But for some reason I got good containers. They had snaps and I opened them to find my ponies dry and happy as can be. I dragged them upstairs and I will finish going through them. The end total is that my ‘few bins’ turned into ten. My hundred or so ponies is probably 300 ponies and pieces. I am going to spend a lot of time on Ebay over the next year or so. My plants are bigger but my harvest is less. I don’t blame the plants as nice as that would be. It decided to rain in Virginia. Last week it rained and rained and rained some more. We learned that the Isis candy are splitters. My first two Orange Russian 117 have ripened. They are lovely but I haven’t had time to do weights. I estimate seven to eight ounces and perfect oxheart shapes. The cherry tomatoes are overflowing. I really recommend cherry tomatoes for people who want tomatoes. The Rapunzel are a disappointment. No long trellis. However, taste wise they taste like large tomatoes which is quite fun. The Sicilian still has curled leaves. I don’t even begin to understand that plant. There are finally tomatoes on the Yellow Brandywine. I’m not impressed with them as producers. They may do better in the soil. Beautiful plants, however. We are past the rain. Everyone is flowering for the next harvest. The Ground Cherries are the real winner. Prolific, easy keepers, and a LOT of sweet berry fruit. Ebay made me an offer today. I can list 500 items for free by July the 6th. I don’t have 500 auctions to list. Ebay has a limit on me as a new seller to 100. Normally they give you 50 listings for free. This means I can list 100 items. I’ve been rolling through the comic books and getting them listed. It makes me ponder the value. Value in comic books is not a straight forward thing. #1 in some series may be worthless but #12 may be a ‘key’ or introduce a character that later becomes a major player or even develop their own series. Batman is an example of this. He appeared in Detective Comics and that is his official 1st comic. There are gems in my collection. I expected this but I’ve found some that are quite exciting. One that I chuckle about is the Tomb of Dracula. I laughed when I saw the title. It is campy now but Dracula had his own comic book series. I figured it was a worthless comic and that proves me to be an idiot. You see, I was reading about Blade the movie series. In that reading it discussed how Blade was introduced in the Tomb of Dracula as a minor character. Today, as I was working on listings I wondered… could I be so fortunate? It turns out, that I am. I have the Tomb of Dracula #10 and I believe it is in good condition. That is the book that introduced Blade and it is a highly sought after comic book. The idea of expensive comic books is exciting. The reality is that selling them is a slow process. There are a lot of comic liquidators out there. They will give what seems like a large amount of a huge lot of comics. I was chuckling at one the other day. No need to figure out grading or how to use ebay just instant money in your hand! Seeing an offer like that pretty much tells you that you have valuable things. There is always so much to do. Work demands my days off. Our ebay adventure is going very well but it still takes time to list and manage everything we are doing. The garden is taking off but pruning, feeding, and tending takes time. It is both good and bad. I am struggling to have the downtime I need to be creative. Most of my down time is spend being exhausted and reading financial management stuff. I’m pretty much debt free and making sure that our next financial ventures are solid choices. But so much ebay. Productive stuff once we put the time into it. The husband seems to hate shipping for some reason. As in the packing and wrapping and dropping off at the post office. It is fascinating what some hate and others do not mind. By our powers combined, he and I can be rather productive since we like and hate such different parts of things. But ugh. Somehow June ran off, I got a lot done, need to do more, and it is time for bed too. We are winning the aphid war. Or, I should say, the ladybugs are. Between work, the heat, and aphids, I’ve ignored my peppers. They’ve not been bothered by the aphids. I figure that the thicker leaves and stems are the reason. I’ve been watching one of my red cheese peppers turning for the last week. Today, as I was fertilizing I said, “Gosh. There are older peppers on it that haven’t changed?” I crouched down and started shifting leaves and low and behold, I had several changed peppers. The realization that I had ignored the peppers hit me. 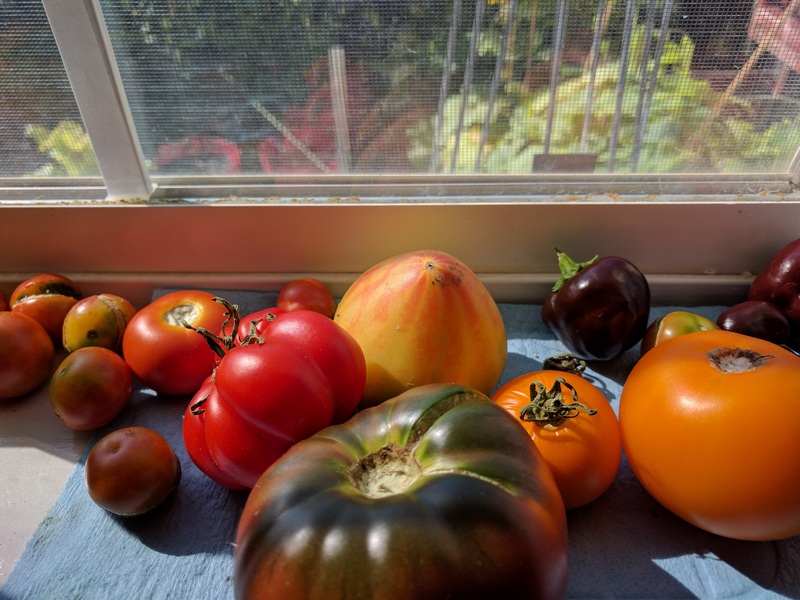 The tomatoes have started to change and I’ve been focused on them. 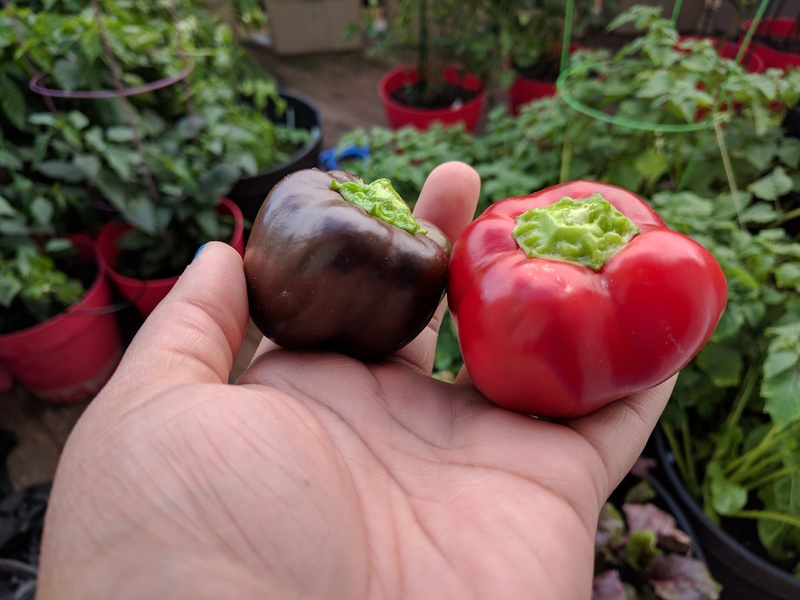 Over on the miniature chocolate bell pepper I found several peppers ready to go. I gave in and purchased ladybugs at the end of May. The aphids where so bad that they looked like scale on the plants. Going into the garden felt gross. Aphids would fall off of everything. Then it wasn’t just green aphids but brown as well. Why me? I wondered. I’m not the only one to be attacked but it was very, very frustrating. That is where the ladybugs came in. I ordered them, set them out as instructed, and left the garden alone for the next two weeks. The good news is that we have baby ladybugs in the garden and the aphid numbers feel as if they have been slashed in half. They are still there but it is not as oppressive as it was. Just in time for the tomato disease to appear. I believe it is a leaf spot disease. It punched the Yellow Brandywine in the face. That plant has not yet made fruit. The Orange Russian 117 is also looking bad but I think its struggle to produce has to do with the aphids draining the blossoms dry. At one point we where uses brushes to try to get them off. So, now I have fewer aphids and a tomato disease ravaging the garden. I pruned heavily on Monday and everything looks better. We’ve seen more young ladybugs and the aphid population is decreasing. Hopefully, we have made ground in this war and the garden will be able to recover. 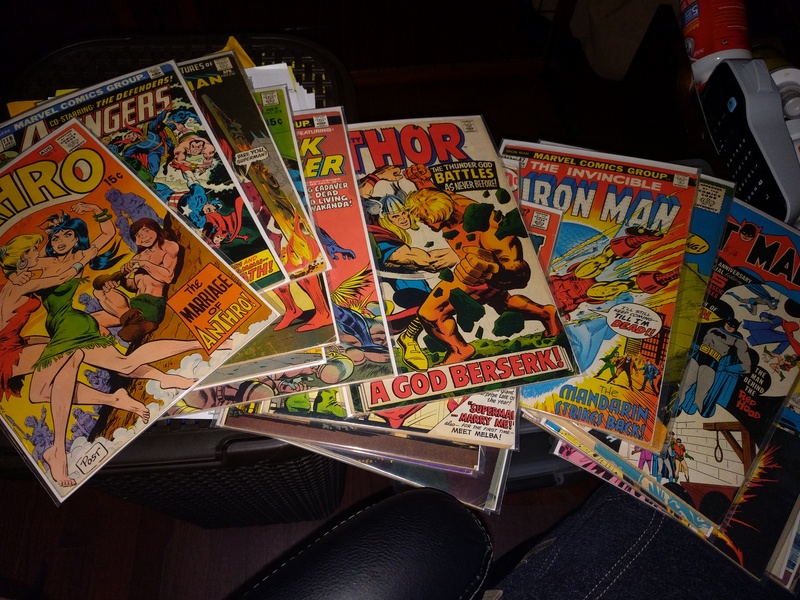 When my father died I inherited his comic books. I gathered them out of the dusty, decrepit Xerox boxes he stored them in. I sorted them, I got bags and backboards, and I organized them. I then struggled to find any help on how to sell most of them. I put out a few feelers but none of them where things that would benefit me. I’m not comic book ignorant. I went through quite a phase when I was 11-15. I still read graphic novels although I have a taste for longer, more complex stories that cause me to buy bundled books instead of individual comics. I spent several weeks documenting the entire thing. I should have alphabetized them at the time but I was too tired. And now, when I go looking for it, I have no idea where I put the file or what I named it. I did try to post on a comic website or two. I was mostly ignored. It is only now, years later, that it occurs to me that there was probably an assumption that I was a troll or lying for attention. After all, it is the perfect storm. “I inherited a bunch of silver age comic books, what do I do?” For as long as I have been online I still forget that many people do nothing more than lie and attention seek. I’ve always seen the internet as a place to gather information, share, discuss, learn, and amuse oneself. Not finding amusement in making up stories for attention leaves me a bit behind the ball at times. I’m going to go for it. Make a spread sheet to track the books and their pictures and put them up on eBay. My husband also has a large amount of ram he has salvaged that we will put up. He doesn’t want to do the leg work but I am willing to do so.